Welcome to FABBYLIFE: Gals, pretty & comfy boots (Materia Prima, made in Italy) on sale now! You Are Here: Home - fashion , Materia Prima , Our Lookbook - Gals, pretty & comfy boots (Materia Prima, made in Italy) on sale now! Gals, pretty & comfy boots (Materia Prima, made in Italy) on sale now! Gals, Michelle and I (see here and here), and lots of my e-friends bought several pairs of boots/booties from Materia Prima (Made in Italy) last year. We are very happy with our purchases. Though the heel is high, and wooden, they are super super comfortable. Their shoes are true to size, if not half size larger. Highly recommended! Yoox has nice customer service, by the way. Don't forget to go through www.ebates.com to purchase from www.yoox.com to get 3.5% cash back. Thanks a lot for sharing! Not as cheap as last year yet. Well, it went down to $79 last year after 2nd or 3rd cut. there is also a rebate of 35 dollars if you introduce your friends to buy. 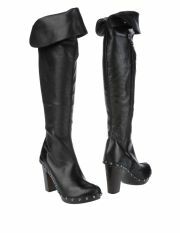 I love these boots, especially the first pair. Unfortunately these is no my size (7.5). too bad. Amy, I have two pairs. My experience is order half size down, if there is no 7.5 available. Thank you Phan. Yes, the size of this brand is pretty generous.